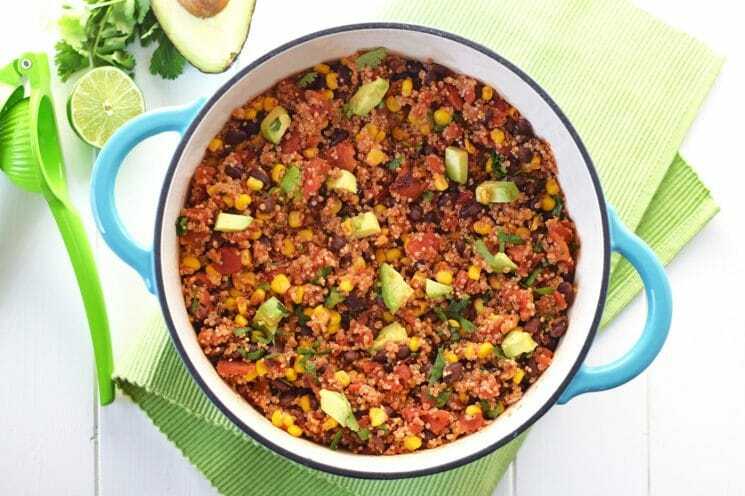 Packed with protein and vegetables, it only takes 20 minutes to have this healthy, nutritious, gluten free One Pot Mexican Quinoa on the table! Hello! Tiffany from Feel great in 8 back again! I am thrilled to be here sharing this incredibly easy and delicious dinner. It takes less than 30 minutes from start to finish and it’s packed with healthy ingredients. 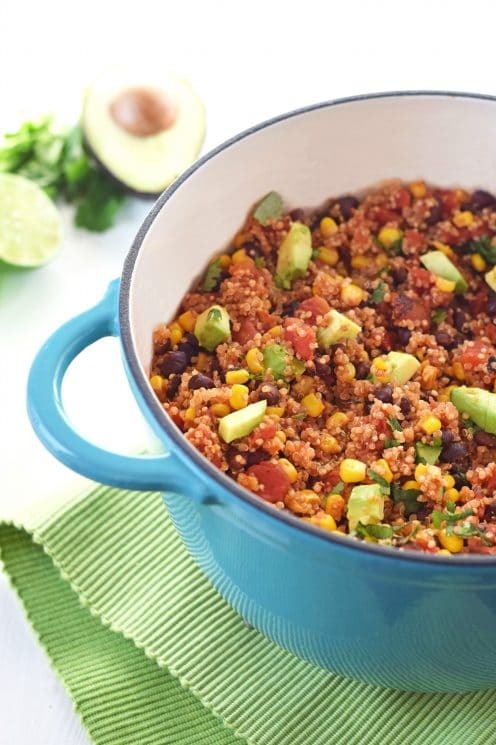 Quinoa is an awesome source of protein and fiber. 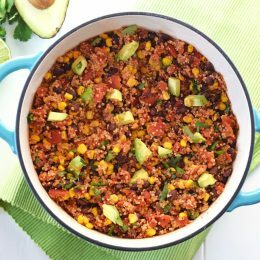 Add beans, veggies, and healthy fat from the avocado and you’ve got a nutritional powerhouse meal that the whole family will love! My kids gobbled this one up! One of the best things about this meal is that you literally dump all of the ingredients into one pan and cook. You don’t even have to cook the quinoa separately! Rinse the quinoa before cooking. Rinsing quinoa removes it’s natural coating, called saponin, which can make it taste bitter or soapy. Even if the quinoa I buy is pre-rinsed, I always take a minute to give it an extra rinse. If you have a fine enough strainer, you can just run water over the quinoa until the water runs clear. I don’t have a fine enough strainer, so I just put the quinoa in a bowl, fill it with water, and stir the quinoa until the water is cloudy. Then I drain that water and start with a fresh batch. It usually takes 2 or three rinses before the water stays clear. Adjust the spices for your family tastes. I have little ones so I avoid making meals that are too spicy, but I do like a little kick. Feel free to adjust the amount of chili powder and cumin to fit your families taste buds. This meal makes great leftovers, but I don’t love mushy avocado, so I just add the cubed avocado to individual bowls. That way when we eat leftovers I can add more fresh fresh avocado. I hope those tips help. I just know you’re going to love this recipe! And, when you’ve tried and loved this one, definitely go checkout my Easy One Pot Tomato Basil Pasta! Heat olive oil in a large pot over medium heat. Add garlic and cook, stirring frequently until fragrant, about 1 minute. 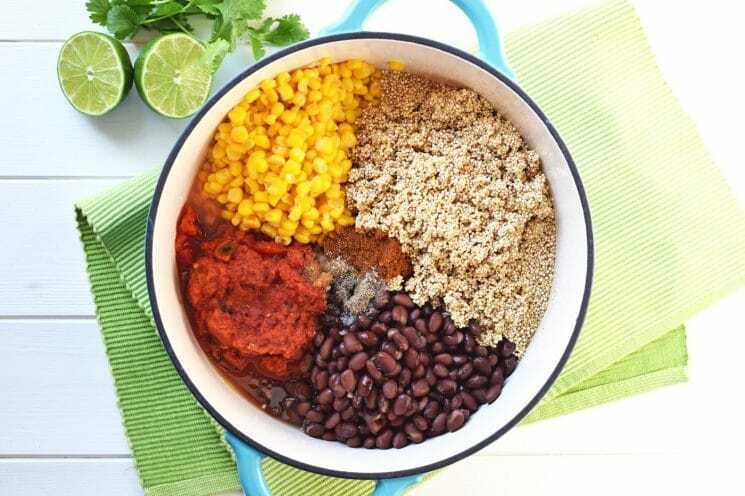 Stir in quinoa, broth, beans, tomatoes, corn and spices. Bring to a boil; cover, reduce heat and simmer until quinoa is cooked through, about 20 minutes. I make something just like this and the leftovers are awesome. Perfect for lunch the next day 🙂 I also like to add some chopped zucchini or bell pepper in the summertime… when I feel like doing the extra chopping! How many servings? And do you drain the corn and beans? Could this be prepared in an electronic pressure cooker like an instant pot? I made plain quinoa in mine the other day and it turned out great. Fyi, this serves so many more than 4. I’ve had it for dinner twice, lunch twice, breakfast once (topped it with a fried egg), my husband has had it twice, and still we have some left. So if you don’t have a huge family… Maybe half it. This makes a huge pot of delicious-ness. Thanks for the recipe! Yes, I drained beans and corn. Took more than double the cooking time both times I made it. Our family loves this dish! We’re having friends over this weekend and I want to make it. Can the recipe easily be doubled? Yum!! We used tortilla chips to scoop it up with! This was the best quinoa I’ve ever made! I’m adding bell peppers next time? Holy Moly! 755 calories a serving? How large a serving? Doesn’t sound “super healthy ” with 1/2 my daily calorie count. Delicious! I cooked for a little longer than 20 min to thicken. How much is a serving??? 125 g of carbs??? That’s NOT healthy unless it’s the entire recipe………..
Hi there! Thanks for pointing this out. This recipe actually serves 6 people, not 4. We’ve updated the recipe and the nutrition facts. You’ll notice it’s still not a low carb recipe, but the carbs come from whole grains, beans, and vegetables. That means they absorb slowly and deliver fiber along with their energy.